Mega Sale! 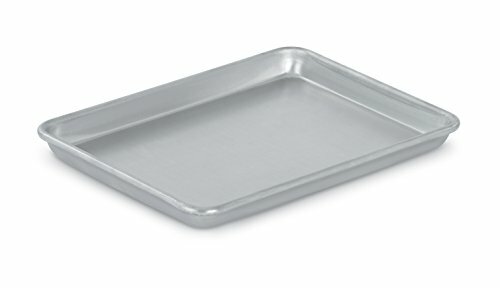 Save 30% on the Vollrath (5220) 9-1/2'' x 13'' Quarter Size Sheet Pan - Wear-Ever Collection by Vollrath at Baking Love. MPN: 5220. Hurry! Limited time offer. Offer valid only while supplies last. This Wear-Ever closed bead natural sheet pan is made of impact-resistant 16-guage heavy-duty 3000 series aluminum. Tapered design for easy stacking. This Wear-Ever closed bead natural sheet pan is made of impact-resistant 16-guage heavy-duty 3000 series aluminum. Tapered design for easy stacking. Sized to fit standard baker's racks. Closed bead includes galvanized non-rusting rod for reinforcements. Concave bottoms flatten during heating for even heat distribution. Coated with non-stick coating for easy food release and cleaning. Available in 1/4-size. Measures 13-inch length by 9-1/2-inch width by 1-inch height.